Notes on nature Are any of these hiding in your garden? Are any of these hiding in your garden? It seems quiet in my garden at the moment. Ok, the birds are still coming to the feeders, but there’s not much else going on. There’s a lull. It seems that my garden wildlife is waiting for winter to slip quietly away. Some of your garden birds are about to start nesting – even in February! Blackbirds, song thrushes and robins are well known to nest early and on the sunnier days recently, I’ve heard all three of them singing as the males issue their battle cries to rivals, and attempt to attract females. Yes – the garden bird breeding season is about to begin! What of the bugs? There can’t be many of these around now, surely? Well, if you have a shed, outhouse or garage, these could be a warm winter home for a butterfly. Species like peacocks, commas and brimstones hibernate as adults and survive our cold winters. 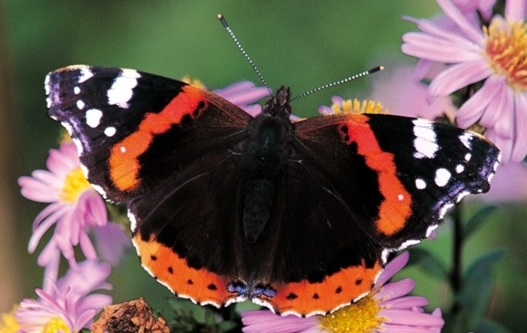 Plus with warmer winters, red admirals are making it through too. But it’s not just the adults. Brown and purple hairstreaks, for example, lay their eggs, resembling small sea urchins, during the autumn and leave these to develop and survive the winter. Other species wait out the winter as caterpillars and even chrysalises, before spreading their wings in spring. Do you have a compost heap or log pile? Snug, warm and dry, these are the perfect winter des-res for a multitude of species, from hedgehogs and grass snakes to frogs and newts. We all know about checking under the bonfire for hedgehogs, and with warmer weather these spiky slug-munchers maybe rustling around your garden. Newts, having climbed out of the pond are looking for somewhere warm, cosy and frost-free – so a compost heap is perfect! It’s around now that they’ll be on the move back to their breeding ponds – staking their claims to the prime spots. So look out for them on dark nights after rain. It’s a similar story for our frogs. As for our dragonflies, well their nymphs could be hiding away at the bottom of your pond – even if it’s covered with ice. Under the water it’s a battleground and they’ll voraciously devour any other pond life attempting to survive the winter. The plants are waking up too: there are snowdrops in full flower here at The Lodge. Their droopy, snow white flowers add a small splash of colour to a winter’s day. They’re followed closely by more colourful flowers though, as daffodils burst into flower: screaming that spring is here! Right now they’re peeking their green shoots above the soil – just waiting for the sun. Do you have broody birds, hibernating hedgehogs or dozing daffodils in your garden? Let me know by leaving a comment below. This morning found a flock of waxwings on the apple tree. Something we have not seen before in this garden in Blackburn. They will probably be gone by the end of the day as there are very few apples left. Two field fares occupied the same tree earlier in the winter, again a first. Lynn F. I don't see the point of leaving these lovely messages if you don't say which town or city you are in. !I will contribute when I am feeling better after illness. Salford City Near Manchester. Hi Folks! I'm pleased to report that our local sparrowhawk is back in action! We haven't seen it through the winter, but it turned up in the garden today! Of course, it might have been around and we simply haven't spotted it and/or it might be a newcomer, but whatever it is - what a beautiful bird! Needless to say everyone else disappeared! Plenty of action from the resident blackbirds claiming their patch, and lovely singing from the robins and thrushes. Lovely to know Spring isn't too far away at last.